If you had one thing to change about how you discussed design iterations, what would it be? I can imagine a few ways, starting with destroying useless email conversations and firing that one guy who can’t seem to do anything on his own. Unfortunately, there’s no program to make people more competent, but there is one that is on the way to reducing email congestion and refine the design process. Vuuch. And it’s about time we had a look at what it does. Vuuch, quite simply, allows you to centralize conversations about designs in a project and more specifically, within the design environment. Instead of decisions being spread out and disconnected across email, phone conversations and meetings, the idea is to keep the content about the design consolidated in your design environment and… wait for it… online. Discussing design problems online – that’s not the typical approach most would think of, but it’s one that worth looking into. So, while everyone copies and pastes screenshots of AutoCAD layouts into an email, let’s get started with Vuuch. 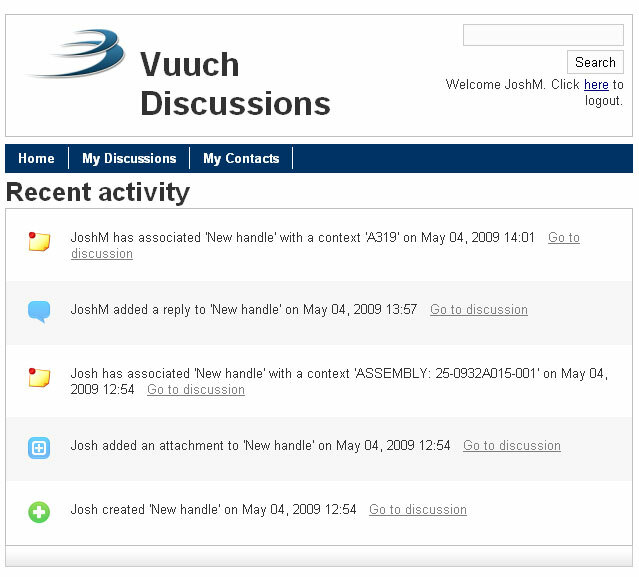 You’ll notice something consistent throughout everything with Vuuch – it’s simple. That can be both good and bad, but we’ll keep in mind that it is currently beta software and in full development for various platforms including Pro/E Wildfire 4.0, SolidWorks 2008 and later and Excel 2007. To start, go online to Vuuch.me, register, install the plug-in and you’re set. Simple. You don’t need to provide a bunch of private data about yourself, but you will need to confirm your email address. 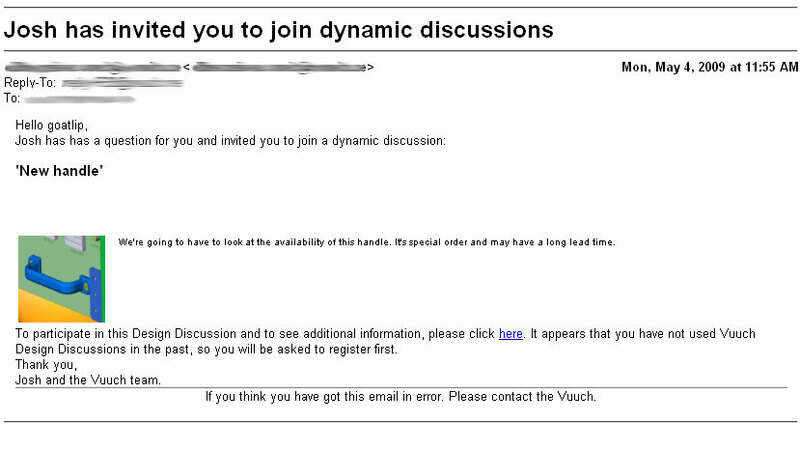 After that, you can login to see your discussions or others you’ve been invited to. But you probably haven’t created any yet, so lets see what that’s like. With the add-on activated inside of SolidWorks, you’ll be prompted to login. (Currently, this happens each time you start up SolidWorks.) 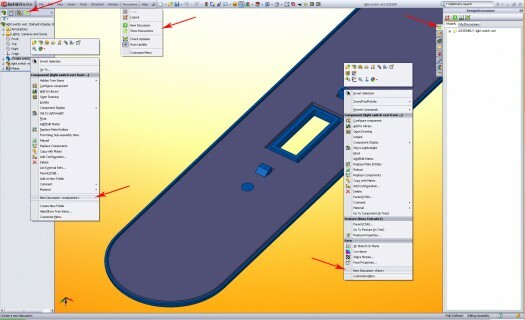 There are five main area of interaction inside SolidWorks where you can view and create discussions. When you select to start a new discussion, a New Discussion box will appear and allow you to add comments about the item you’ve selected. Three tabs are available Discussion, Participants and References. 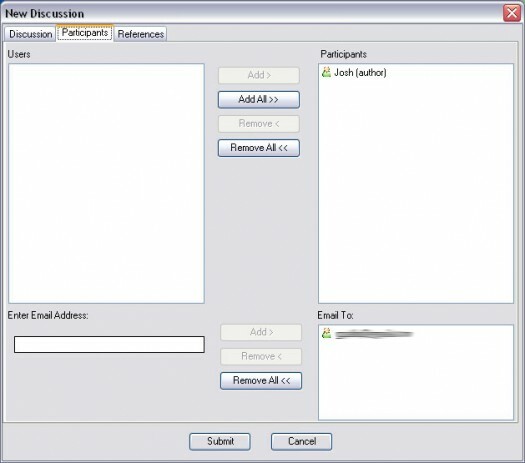 You simply add a title and comment in the Discussions pane and add emails of the people you want to invite in the Participants pane. Here are views of what you will see in the offline interface. Adding References is a feature that is definitely needed and will be supported in a future release. Ideally, this would allow you to reference another part or assembly, a document, a discussion or a combination of all three. The online interface is as basic as the offline interface, but it has all the data and even some more functionality than what the plugin’s interface offers, a definite bonus for those that do not have the design tool you are using. You have three main areas, Home, My Discussions, and My Contacts. Here’s what you’ll see in the online interface. While this isn’t a contact management system, it currently takes some understanding how to add contacts. The My Contacts page simply shows names of people you’ve added via the design environment or while editing a discussion online. The only way to add a contact here right now, is to search for participants that have been added and invite them. Ironically, the very tool that drops us into a communication abyss, is what’s used to start off the discussion with people outside of Vuuch. Email. You’ve got to pull them in someway right? No big deal. It’s how and where the rest of the discussion happens. The email you receive just happens to be a very simple request to join ‘dynamic discussions.’ In the email (as shown below) you see the discussion title, thumbnail and comment. But there’s more to the connectedness that just an email that goes out to a new participant. 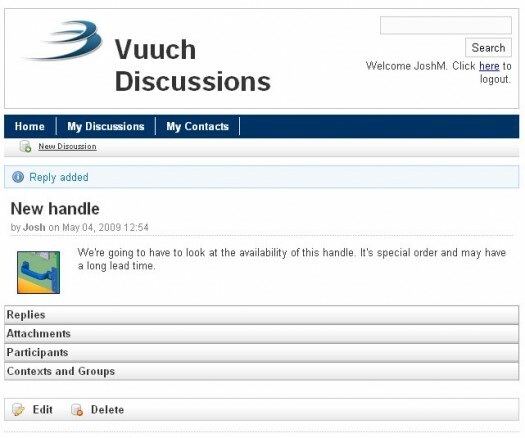 Ideally, if you and I are using Vuuch within a CAD package, like SolidWorks, and all the discussion about the model has taken place inside that environment, we avoid having to search for emails, or look through notes, or remember comments someone had in a meeting. This keeps the conversation about the model connected to the model. More than likely though, there will be some discussion that doesn’t get captured. This may have more to do with the responsibility a designer or engineer has than the ability of any program to capture absolutely everything. So, without going on and on, here’s the good and the bad, the smack and the whack, of what Vuuch offers. Quick registration, download and install – Fast, easy and not a lot required. Nice. No Options – Would be nice to have options for what to show on homepage, change password, put in other information, add connections to people/environments. My Discussion not shown immediately – to see existing discusions, you need to select Browse all discussion. Would be nice to see them all after ‘My Discussions’ is selected. No way to remove a contexts – Once it’s added, it stays. Some contexts are vague. need visual or note. As a supplement to the review, here are some things that can help you if you decide to give Vuuch a try. So, how do you bring Vuuch into your workflow? You may be use to sending emails about issues or adding it to an “Action Item” list or “Issue Tracking” program. Don’t worry. You can still use the internal programs used in your company. 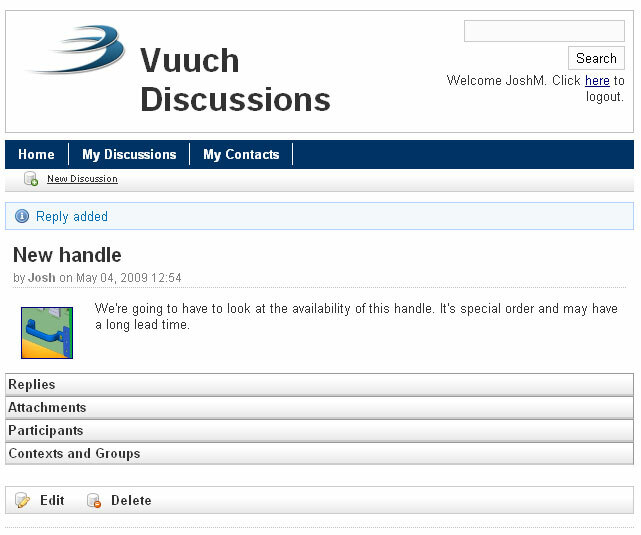 Vuuch can serve as an additional tool for keeping track of discussions specifically about a model. Here are some tips. There’s not much to this. You can start by using this to track the issues you come across in your own design. You’ll create a discussion, emails will go out. People will inherently wonder what you’re using and simply put, you’ll tell them Vuuch. I much prefer and recommend this route. It eliminates a lot of expectations from you for how software should or shouldn’t work. They’ve seen how it works by getting discussion requests from you. If they are using a supported CAD packages, they see the benefit of having the discussions directly in the interface. The thumbnail screenshot, that shows up in the discussions andis sent to participants, is of the entire screen, not what you’ve selected. You’ll need to zoom in, if you want to show an edge or certain part in the thumbnail. If you’re working in the online interface you need to create a new discussion before you’re able to add participants. Discussions will not be saved in the model if it is read-only, be sure to check it out. 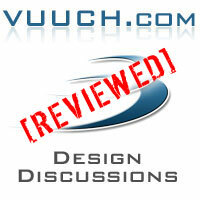 Keep an eye out for the Vuuch review coming out in the next issue of Develop3D! If you don’t have a FREE subscription get one today to download free issues! Develop3D keeps you up to speed on the coolest things happening with lifecycle management, design and related technology and is probably the indirect reason why you have a job.